It’s been such a wonderful experience for us to work together on The Vault – TrueBlood-online since Shadaliza opened the site in September 2008. It actually seems like yesterday when we (Shad and Lynn) first started, but instead, it has really been over seven years of wonderful fun reporting about our favorite show, True Blood. Yesterday marked the one year anniversary of the date that the very last episode of True Blood Season 7 aired on August 24, 2014. Since a full year has passed, and after having posted over 10,000 posts, conducted more than 50 interviews, attended countless events about the show and it’s cast and raised nearly $60,000 for charity we now feel it’s time for the site to “go to ground.” Therefore, from this day forward we will no longer be posting regularly. Our plan is to only post news about the show itself that we deem important enough to share. 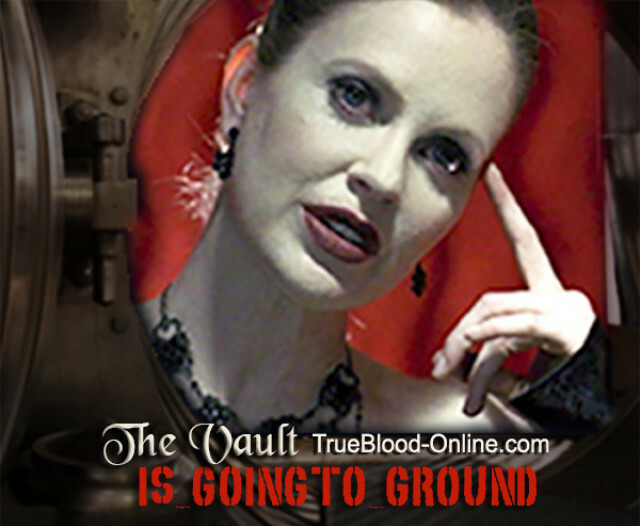 The Vault will remain online to serve as an archive for the fans as their resource for all things True Blood. Our Twitter and Facebook accounts WILL REMAIN ACTIVE! We want to say thank you to HBO and the awesome cast and crew of True Blood for allowing us to experience with them the wonderful and crazy True Blood ride. We also wish to express our gratitude to all the fans who have supported us throughout the show’s seven seasons by visiting our site, leaving their comments, participating in our True Blood auctions for charity and more. We will always remember how True Blood changed our lives and brought such joy, not just to us, but to all involved. So finally, with much emotion we say… BYE BYE! I understand your decision, but will miss you terribly. The Vault is the first site I go to when I log on each day. And I visit multiple forums. I’m glad to know the site will remain as a True Blood archive, and that you will be posting TB news that you deem important. Shad and Lynn, thank you for this amazing ride, for your dedication and devotion to True Blood, for your hard work. Bless you both. You’ve served the show, cast, crew and production staff, and the fans so very well. I have loved every post and every minute of the past 7 years. You both made True Blood much more than just a tv show for me. Congratulations on having such a wonderful site and thank you! We had a blast but it’s time to move on. We are counting down to TBX. Rowena75 Hugs and kisses to you dearest! Thank you so much for your loyal support! See you on AllStephenMoyer.com and the forum! Can’t wait for TBX to start. Thank you Cindy Wood, so did we. We say goodbye with mixed emotions. Thanks Lisa, we both really appreciate your support throughout the past years. ShadalizaMonterosa Rowena75 Thanks, Shad. It’s been my pleasure. You will definitely see me on ASM and the forum. Eagerly anticipating TBX and the pictures, info, news, videos, that will come from the show. smiles okay ty for keeping us up to date i enjoyed it every time. Aww :( Always been on of my favourite accounts. It’s been awesome reading post people have posted and you both too. I will miss this site. Always been a big hit! Bye, you will be missed as we miss the show. Thanks for your continued support Shannon! Enjoy the ride rewatching Laurie. I can’t yet, need more time before watching it again. Love TB so much! Thanks Teri – The site will remain online as an archive and the Facebook and Twitter accounts will be online, too. Bills4me Thanks so much for your support B4me, it’s been a wild but wonderful ride! Rowena75 Thanks Row, you’re a loyal True Blood fan for sure and we love that about you! Feeling sad :-(- but I’m so looking forward to to watch TBX…September 15th is right around the corner…I can’t hardly wait!!! The Vault was my favorite source of True Blood news, photos, and fun. You did a great job, Lynn and Shad–thank you for all the years of talent and hard work! Thanks so much Mary! We appreciate your support! We know we’ll all be thrilled by TBX Amy, thanks for your support! A wonderful job done over the past years. My favourite True Blood site. Awesome True Blood site…going to miss the posts! Lynnpd99 Rowena75 Thanks, Lynn. Your kind words are much appreciated. True Blood will always have a place in my heart! It was the best! Thank God for DVDS!! My heart stopped a bit when I saw the news but I am so respectful of you two ladies and happy to have been a part of this wonderful site. Shad and Lynn – without you my True Blood experience would not have been the same – I thank you profoundly. I still remember back in S1 when I found The Vault, it was such a relief to be on a hate free site! I look forward to still being on ASM and one day to work on my forum skills. Thank you for your tireless fundraising and advocating on behalf of the True Blood family, you ladies are special! Also, leaving the site open is greatly appreciated as it is a fangtastic source of TB history and information. A super job well done, bye bye The Vault! You and Shad are responsible for MY OBSESSION – well and Stephen Moyer too. A really big thank you for all your great work on The Vault. Man, I miss TB! callonmebill Thanks so much for your support. Yes, it truly is an end of an era and it was a fun time! Totally depressed…..True Blood Forever…..see you in the after life! Thanks for all the memories! Aww! I’m sadden to see The Vault go. Thank you Lynn and Shad for your hard work to keep the site so informative. callonmebill thank you for your lovely words. It’s fans like you that made this amazing ride extra special. We will continue with AllStephenMoyer.com and Stephen’s new show TBX. lisadelgrande Thanks Lisa, we appreciate your support of us and True Blood! Shad and Lynn you did an awesome job! Thank you for making my True Blood experience even more enjoyable. Thanks Marshaa for all your contributions during the last 7 yrs. Thank you, guys, so much for eight wonderful years. Really appreciate all your hard work, dedication, patience, and enthusiasm. The True Blood experience wouldn’t have been the same without your website. All the best to you both, Shad and Lynn. Rina2014 Thanks so much Rina, we really appreciate all the support you and the fans have given us throughout the past years! You ladies know the reason but I am very sorry I am so late to post a belated but fond farewell to The Vault and thank you for hosting the number 1 site for all things TrueBlood. I have so enjoyed participating with other fans to read about and discuss our different points of view. The Vault through your hard work enhanced the experience of the show and all that entails. If I have not expressed my appreciation of both Lynn and Shad over the years then shame on me because stopping by the Vault was a daily visit. Cheers for a job well done.